Dr. Kardaris thoroughly explains the dental implant procedure and answers any question you may have. 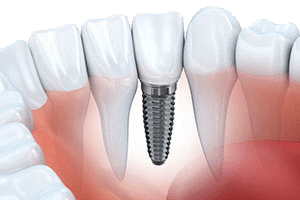 A dental implant is a replacement tooth using a titanium post for the root and a porcelain crown attached to the post via a connecting piece called an abutment. Dental implants can also be used to support dental bridges and dentures. Dr. Kardaris has years of experience in placing dental implants. She has taken special implant courses and has certification for placing implants. Dr. Kardaris can take care of most of your implants needs in-house. Using special advanced implant software, she can prepare for the implant placement without need for additional surgery. She does her best to make the whole procedure comfortable and as minimally invasive as possible. Dr. Kardaris feels a great responsibility for making sure that your implant is a long-term success. She ensures that you are completely set-up to receive implants so that they remain healthy and will last you a very long time. She doesn’t cut corners and plans your treatment carefully so that, once placed, the implant maintains its functionality for a very long time. 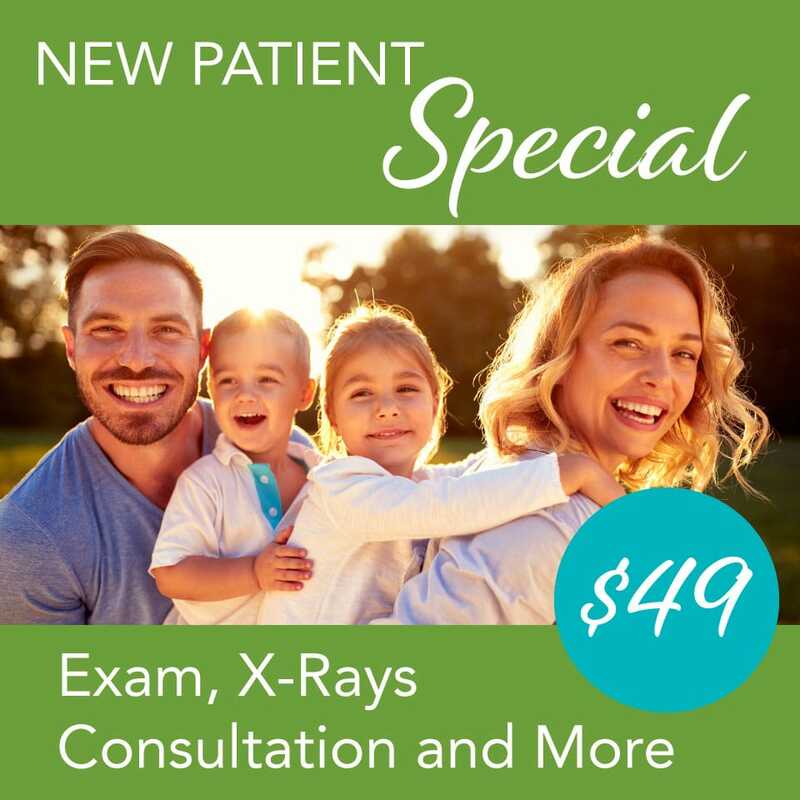 The first step is to meet with Dr. Kardaris for your free consultation. 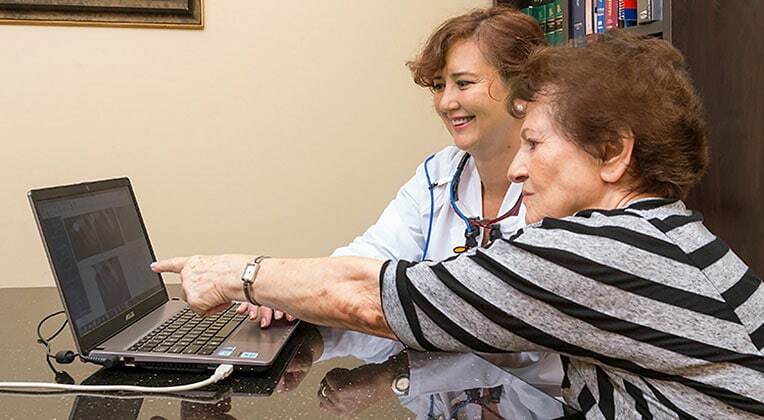 Together you will review your treatment options and you will get all your questions answered. Once this is done a plan is made. 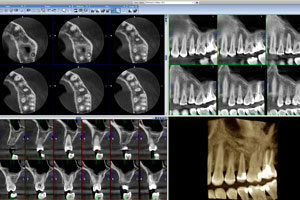 3D cone beam X-rays capture high-quality images used in planning dental implant placement surgery. Once you decide that a dental implant is right for you, Dr. Kardaris gathers all necessary diagnostics using high-tech equipment. Digital X-rays are captured with our 3D cone beam CT scanner to get a 360 degree view of the entire jawbone, which makes the implant placement surgery more precise and efficient. 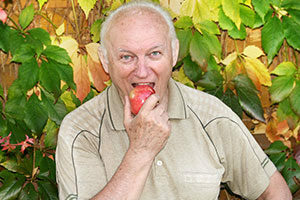 Intraoral and exterior photos are also taken to help with the planning phase of your treatment. Dr. Kardaris then thoroughly reviews your medical history and conducts an oral exam. Impressions are made to make study models to prepare for the implant. Dr. Kardaris uses the images of the jaw and teeth to view the exact position of your teeth, nerves and gums. She can measure your bone depth and assess if bone grafting is needed. She uses all the information gathered, the study model and the X-rays to create your treatment plan, including plotting the precise position and angle of the dental implant placement. Using special software, Dr. Kardaris designs a surgical guide for your surgery. The guide is positioned over the gums during surgery and guides the implant precisely. 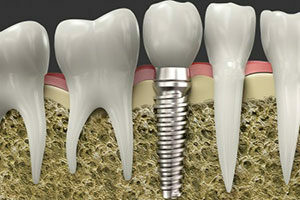 In this way the implant is placed in the most ideal position. This makes the surgery quick and safe. The use of the guide reduces the risk of nerve damage, sinus perforation and arterial damage. 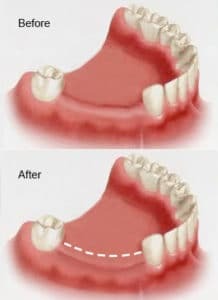 Where extractions are needed, Dr. Kadaris takes out the tooth very carefully, usually in pieces, so as to preserve the shape of the socket and to minimize damage to the surrounding bone and gums. Bone structure can diminish when missing teeth are left un-replaced. Grafting is done to build up the bone structure to be able to support the dental implants. If teeth have been missing for a long time you will have experienced bone loss. In the first year after extraction or tooth loss, 25% of the bone is lost to bone resorption and the bone loss continues. In some cases, bone is lost prior to tooth loss due to severe periodontal disease. Where there is too little volume of bone to sustain an implant, Dr.Kardaris will augment the bone with a bone graft. In many cases, Dr. Kardaris can place the bone graft at the same time as the implant, unless the bone is severely compromised. We understand that many people fear the dentists, and we want you to know that your comfort is a top priority for our entire team. We offer a variety of amenities to keep you comfortable throughout the procedure. In addition to the right amount of local anesthesia to keep you out of any pain, we also offer oral sedation to keep you relaxed. Once it is nicely healed Dr. Kardaris makes your permanent restoration. She uses the laser to uncover the implant, which is a fast non-surgical method. She then fits a titanium abutment that connects the implant with the replacement tooth and takes impressions in preparation for your new tooth or teeth. Our replacement teeth are fabricated from high-grade materials by a top quality lab, ensuring an aesthetic and natural-looking finish. 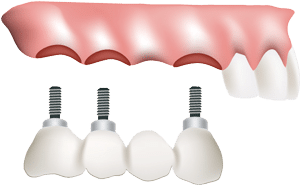 Our single-tooth replacement crowns are made from durable, translucent porcelain, as are our implant-supported dental bridges. We use a very natural-looking acrylic for our implant-supported dentures.